I'm not skipping a week already, I'm just really cutting things close. I've been a miserable critter all week, but I'm a smaller miserable critter. I'm down 7 pounds! The first week is usually easy and jubilant, but my timing was knowingly bad. I won't call it intentional, but I picked a specific start date and I stuck with it despite it being that week. Hormones turn me into an eatmonster, so finding a balance between satisfying horrible cravings and not blowing my points for the day...was...interesting. Looks like I broke my diet, no? No! This splurge was calculated to fit my day perfectly. Like last week, I'd been eating light while at work and then treating myself at home to try to pacify my hormones a little. On Wednesday I'd barely used any of my points when my partner asked me if I was making anything for dinner. I know him well enough that I asked where he was going for takeout. This man just will not cook! It's pretty obvious he said "Wendy's". I popped open one of my favorite resources, Exercise 4 Weight Loss, and started figuring out what I could "afford". 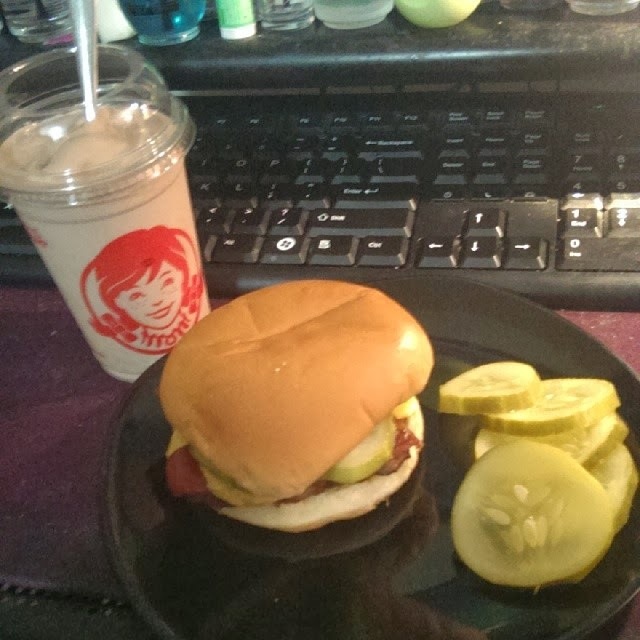 I went with a Junior Bacon Cheese Burger (11-ish, no mayo) and a small Chocolate Frosty (8). Hit the spot like nothing else could have and I was still well within my points for the week! This is exactly why this kind of plan works for me. I can't always tell myself no, flat-out, when the hormones take over, but I can compromise with myself. On a plan like this, there's always a workaround and I never have to go without anything. That said, this is a rare treat. The sodium is way higher than I usually like and it's greasy. Still, it was so good and I didn't have to feel the least bit bad about it! This is how I know I can stick with this. It's got the flexibility and freedom I need. In case you missed it, Nichole has joined me! She's going the low carb route, but not super-low. We're probably going to be eating pretty similarly, since what I'm doing is essentially a balancing act between carbs and fat on the "bad" end and fiber and protein on the "good" side. I'm really thrilled that she's doing this...now I just need to get her to quit smoking.